Benzimidazole is a heterocyclic moiety whose derivatives are present in many of the bioactive compounds and posses diverse biological and clinical applications. Benzimidazole agents are the vital pharmacophore and privileged sub-structures in chemistry of medicine. They have received much interest in drug discovery because benzimidazoles exhibited enormous significance. So attempts have been made to create repository of molecules and evaluate them for prospective inherent activity. They are extremely effective both with respect to their inhibitory activity and favorable selectivity ratio. Benzimidazole is most promising category of bioactive heterocyclic compound that exhibit a wide variety of biological activities in medicinal field. 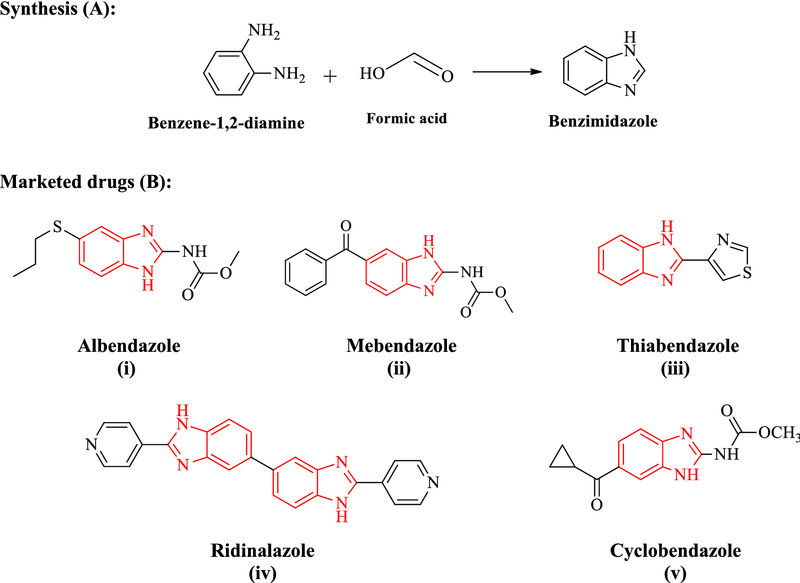 The present review only focus on antimicrobial activity of reported benzimidazole derivatives may serve as valuable source of information for researchers who wish to synthesize new molecules of benzimidazole nucleus which have immense potential to be investigated for newer therapeutic possibilities. Benzimidazole is a dicyclic organic scaffold having imidazole (containing two nitrogen atoms at adjoining site) attached with benzene ring. Benzimidazole considered as potential bioactive heterocyclic aromatic compounds with a variety of biological activities like anti-inflammatory , antiparasitic , antimalarial , antimycobacterial , antineoplastic , antiviral , antihypertensive  and anticonvulsant  activities. Benzimidazole (synthesis (A); Fig. 1) and its derivatives are the most resourceful classes of molecules against microorganisms . The increase in antimicrobial resistance to existing drugs necessitated the search for new molecules for the treatment of bacterial infections [10, 11]. Currently, a number of benzimidazole containing drugs are available in market namely: albendazole (i), mebendazole (ii), thiabendazole (iii) ridinalazon (iv) and cyclobendazole (v) (marketed drugs (B); Fig. 1). Ansari et al. synthesized 2-substituted-1H-benzimidazole derivatives by nucleophilic substitution reaction and evaluated their antimicrobial activity against selected microbial species. The compounds 1a, 1b, 1c and 1d showed good antibacterial activity as well as compound 1c showed good antifungal activity (Table 1, Fig. 2). SAR study inferred that at 2-position of oxadiazole ring increased side chain carbon atom number causes an enhanced the antimicrobial activity toward C. albicans, S. aureus and B. subtilis and also the para-substituted phenyl nucleus supported the activity . Ansari et al. reported a series of 2-mercaptobenzimidazole derivatives and screened for its in vitro antimicrobial activity (using cup-plate agar diffusion method) against selected microbial species i.e. E. coli, B. subtilis, A. flavus, C. albicans and A. niger. Structure activity relationship studies revealed that compounds having o-Cl (2f and 2h), o-CH3 (2g and 2i), –OH (2b, 2c and 2d) and p-NH2 (2e) groups in phenyl ring as well as compound 2a without substitution displayed significant antibacterial potential which is comparable to the reference drugs (Table 2, Fig. 2) . Arjmand et al. synthesized novel Cu(II) complex benzimidazole derivative via condensation of 2-mercaptobenzimidazole with diethyloxalate and screened for their antimicrobial activity against bacterial (E. coli, S. aureus) and fungal (A. niger) species. Compound 3a exhibited highest activity against the bacterial as well inhibited the growth of fungal species (Table 3, Fig. 3) . 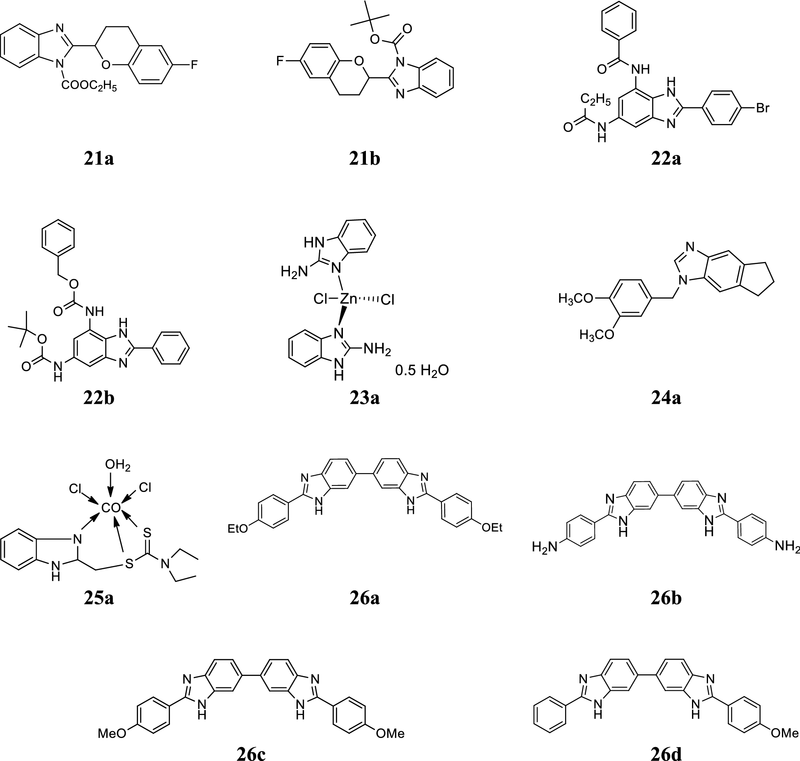 A novel series of benzimidazole derivatives was reported by Ayhan-Kilcigil et al. and evaluated for its antimicrobial potential against selected strains by the tube dilution technique. Compound, 4a showed significant antimicrobial potential against B. subtilis and P. aeruginosa with MIC values of 12.5 and 25 µg/mL, respectively which is comparable to ampicillin (MIC = 6.25 and 25 µg/mL) as well 4a and 4b (Fig. 3) showed good antifungal activity with MIC values of 6.25 and 12.5 µg/mL (C. albicans) as comparable with fluconazole (MIC = 6.25 µg/mL) and miconazole (MIC = 3.125 µg/mL) . Bandyopadhyay et al. synthesized new class of 1,2-disubstituted benzimidazole derivatives using Al2O3–Fe2O3 nanocrystals as heterogeneous catalyst under mild reaction conditions and evaluated for its antibacterial activity (Kirby–Bauer disc diffusion method) against B. cereus, V. cholerae, S. dysenteriae, S. aureus and E. coli. Compounds, 5a, 5b and 5c (Fig. 3) showed good activity as compared to standard ciprofloxacin. Additionally, compounds 5a and 5c showed absolute bactericidal activity against tested strains within 24 h, whereas ciprofloxacin kill those bacteria in 48 h (Table 4) . Barot et al. developed some novel benzimidazole derivatives and evaluated for their antimicrobial potential towards P. aeruginosa, E. coli, B. cereus, K. pneumonia, S. aureus, E. faecalis, C. albicans, A. niger and F. oxyspora and compared to standard drugs ofloxacin metronidazole and fluconazole. From this series, compounds 6a and 6b revealed good antibacterial activity where as compound 6c showed significant antifungal activity (Table 5, Fig. 3) . Desai et al. 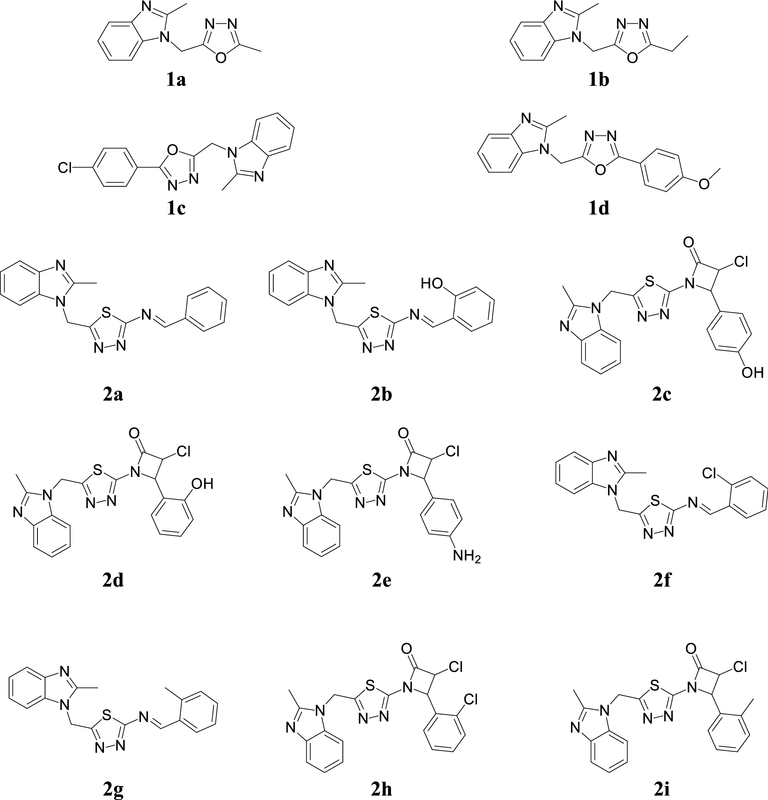 reported a series of 2-mercaptobenzimidazole and β-lactum segment derivatives containing –CONH– and evaluated for its in vitro antibacterial (Kirby–Bauer disc diffusion technique) and antifungal potentials against tested microorganisms using streptomycin and flucanozole as standards. Among the synthesized compounds, 7a displayed tremendous inhibitory activity against B. subtilis, 7b showed excellent activity against E. coli and S. aureus, 7c showed considerable activity against A. niger and 7d showed significant activity against C. krusei (Table 6, Fig. 3) . Desai et al. reported new benzimidazoles bearing 2-pyridone and evaluated for their antimicrobial activity against S. pyogenes, E. coli, S. aureus, P. aeruginosa, C. albicans, A. clavatus and A. niger by conventional broth dilution technique. Among the synthesized compounds, 8a, 8b, 8c and 8d (Table 7, Fig. 4) having electron withdrawing group (nitro) at the m-position enhanced the antibacterial activity and compared to chloramphenicol while compound 8e displayed most effective antifungal activity and comparable to standard ketoconazole . Dolzhenko et al. prepared novel 3,4-dihydro [1, 3, 5] triazino[1,2-a]benzimidazole compounds and screened for their in vitro antibacterial activity by twofold serial dilution technique. Compound 9a exhibited good antibacterial potential as compared to standard drug tetracyclin (Table 8, Fig. 4) . Goker et al. developed novel substituted benzimidazole carboxamidine molecules and assessed for their antibacterial activity by tube dilution method against selected microbes. Compounds 10a and 10b displayed significant antibacterial activity (Table 9, Fig. 4) as comparable to standard drugs (ampicillin and sultamicillin) . Gumus et al. synthesized platinum(II) complexes with substituted benzimidazole ligands and evaluated for their antimicrobial potential against S. aureus, P. aeruginosa, S. faecalis, E. coli and C. albicans using the macro dilution broth method. Complex 11a (MIC = 100 µg/mL) exhibited good antibacterial activity against S. faecalis, 11b (Mpyrb- methyl α-pyridyl benzimidazole, MIC = 50 µg/mL) against C. albicans and 11c (Merb- mercaptobenzimidazole, MIC = 50 and 100 µg/mL) (Fig. 4) found active against S. faecalis and S. aureus . Guven et al. reported a new class of benzimidazole and phenyl-substituted benzyl ethers and evaluated for its antimicrobial potential against selected microbial species. Among the synthesized derivatives, compound 12a (Table 10, Fig. 4) exhibited good antibacterial activity and comparable to the standard drug . Hu et al. designed new bis-benzimidazole diamidine compounds and evaluated for their antibacterial activity against tested species and compared to standard drugs (penicillin G, vancomycin and ciprofloxacin). Compound 13a exhibited the potent antibacterial activity than vancomycin (Table 11, Fig. 5) . Jardosh et al. 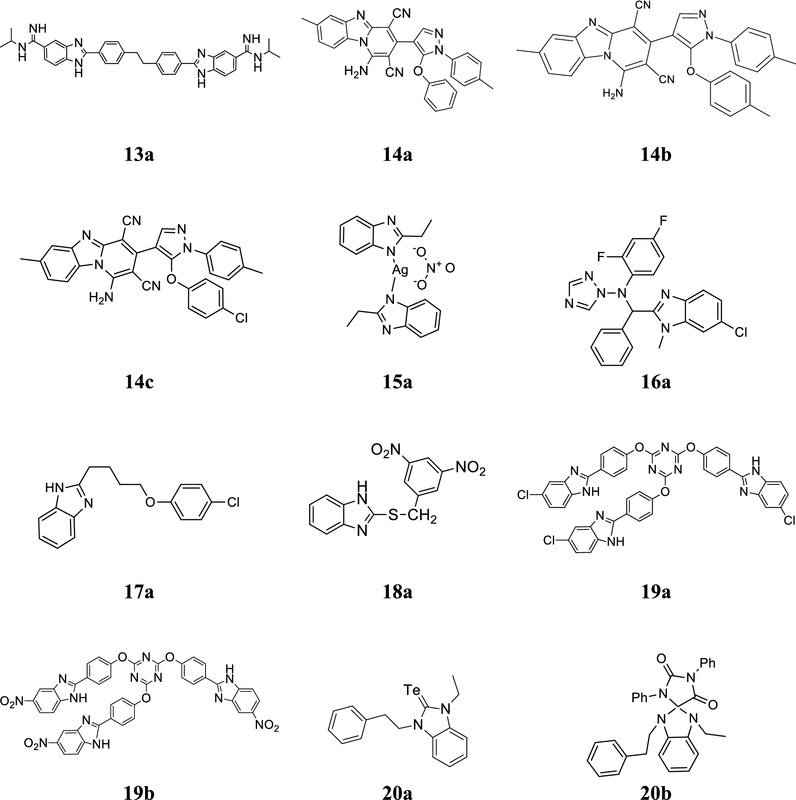 developed a novel series of pyrido[1,2-a]benzimidazole derivatives and assessed for its in vitro antimicrobial activity against S. typhi, S. pneumoniae, E. coli, C. tetani, V. cholera, B. subtilis, C. albicans and A. fumigatus using broth micro dilution technique. Among the synthesized derivatives, compounds 14a–14c (Fig. 5) displayed the good antimicrobial activity and compared to standard drugs (Table 12, Fig. 5) . Kalinowska-Lis et al. synthesized silver (I) complexes of benzimidazole and screened for their antimicrobial activity against S. epidermidis, S. aureus and C. albicans. In this series, compound 15a (Fig. 5) exhibited good antifungal but moderate antibacterial activity as compared to standard drugs AgNO3 and silver sulfadiazine (AgSD) (Table 13) . Kankate et al. developed novel benzimidazole analogues and screened for their in vitro (tube dilution technique) and in vivo antifungal activity (kidney burden test) against C. albicans. Compound 16a (Fig. 5) exhibited superior in vitro antifungal activity with MIC value of 0.0075 µmol/mL as comparable to fluconazole while in vivo activity was significantly less (P < 0.001) . Khalafi-Nezhad et al. synthesized some chloroaryloxyalkyl benzimidazole derivatives and screened for their in vitro antimicrobial activity against S. typhi and S. aureus using disk diffusion method. Compound 17a showed good antibacterial activity against the tested microbial species (Table 14, Fig. 5) . Klimesova et al. developed a chain of 2-alkylsulphanylbenzimidazoles and evaluated for its in vitro antimycobacterial and antifungal activities against selected strains using isoniazide and ketoconazole as standards. 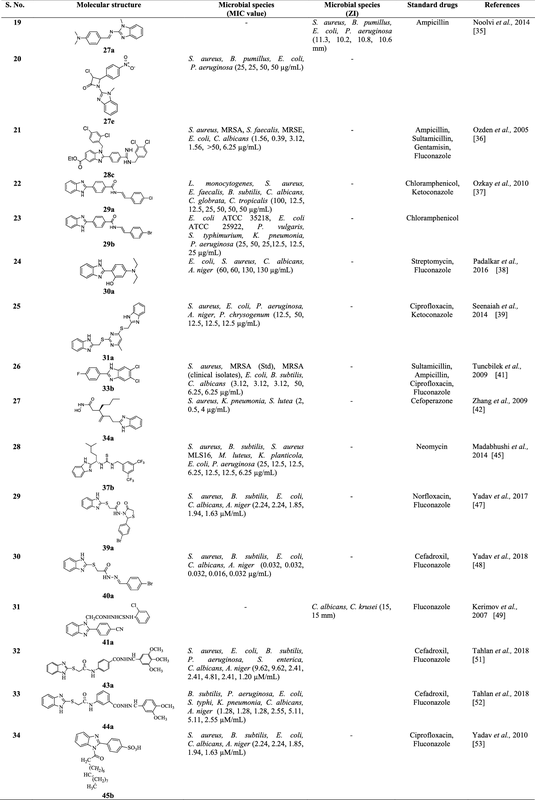 Among the synthesized compounds, 18a exhibited significant antimycobacterial and antifungal activities (Table 15, Fig. 5) . Koc et al. 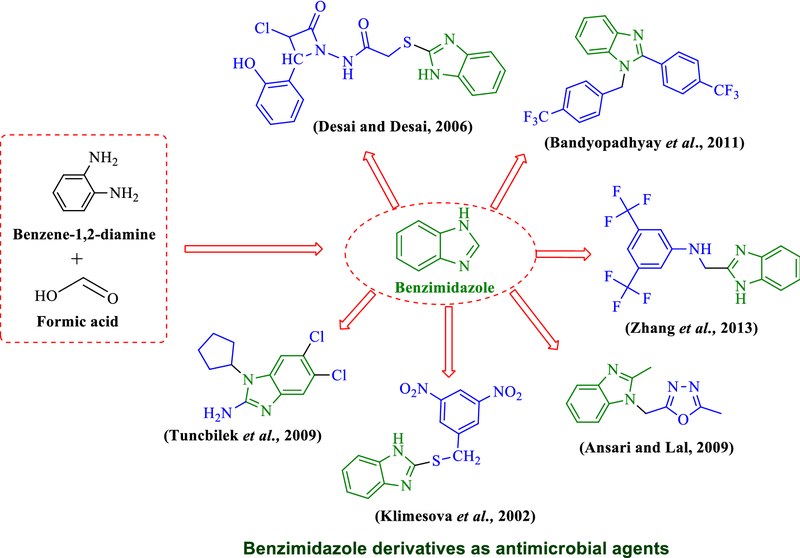 synthesized few tripodal-benzimidazole derivatives and evaluated for their antibacterial activity against S. aureus, B. subtilis and E. coli by standard disk diffusion technique using gentamycin as reference. 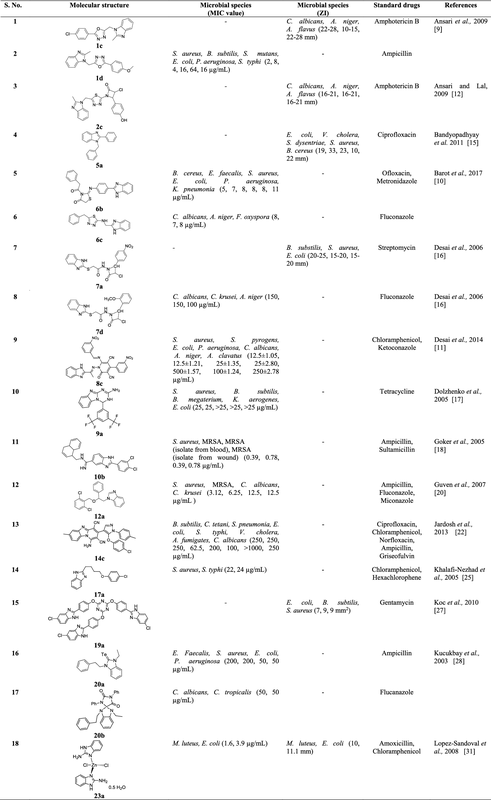 Among the synthesized compounds, 19a and 19b exhibited good antibacterial activity toward E. coli, S. aureus and B. subtilis (Table 16, Fig. 5) . Kucukbay et al. synthesized new electron-rich olefins benzimidazole compounds and evaluation for their in vitro antimicrobial activity against the selected microbial species and compared to standard drug. Among the prepared compounds, 20a and 20b were found to be most effective against C. albicans and C. tropicalis (Table 17, Fig. 5) . Kumar et al. developed a new series of substituted benzimidazole scaffolds and screened for its in vitro antibacterial potential against S. aureus and S. typhimurium and compared to cephalexin as standard. Compounds, 21a and 21b exhibited good antibacterial activity against S. typhimurium whereas showed pitiable activity against S. aureus (Table 18, Fig. 6) . Kumar et al. reported a series of trisubstituted benzimidazole molecules and screened for its antimicrobial potential against F. tularensis LVS strain using Microplate Alamar Blue assay. Compounds, 22a and 22b (Fig. 6) exhibited promising antimicrobial activity with MIC values of 0.35 and 0.48 µg/mL . Lopez-Sandoval et al. reported a series of cobalt (II) and zinc (II) coordination complexes with benzimidazole and evaluated for its antimicrobial potential by disk diffusion method and antibiotics microbial assays (U.S.P 23) against P. aeruginosa, E. coli, S. typhi, M. luteus, S. aureus and P. vulgaris. Among the synthesized complexes, complex 23a exhibited good activity toward M. luteus and E. coli (Table 19, Fig. 6) . Mehboob et al. reported a class of second generation benzimidazole derivatives and screened for its antibacterial activity against S. aureus, MRSA, F. tularensis and E. coli. Among the synthesized compounds, 24a exhibited good antibacterial activity against selected bacterial strains (Table 20, Fig. 6) . Mohamed et al. 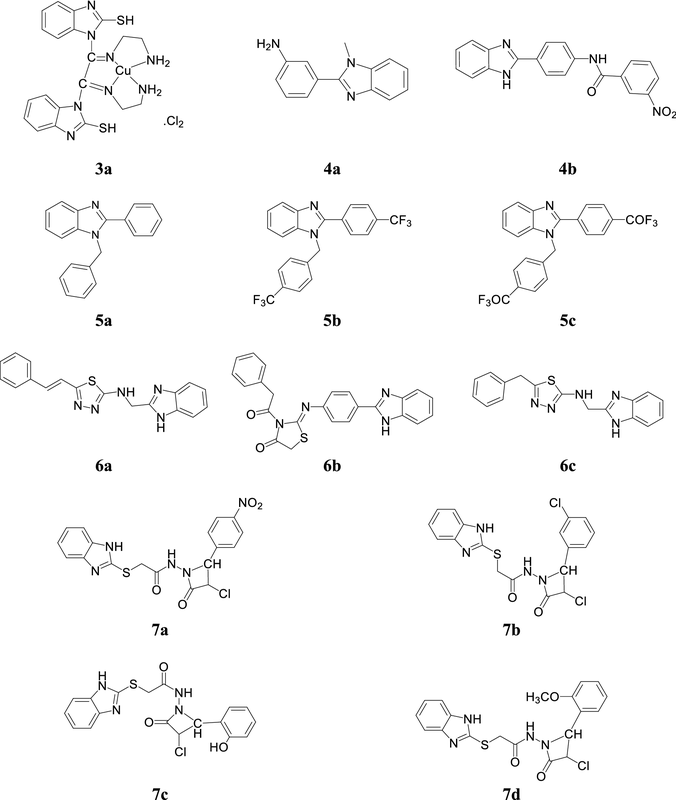 reported a class of seven transition metal complexes of benzimidazole and assessed for its antifungal activity against F. solani, R. solani and S. rolfesii. Among the synthesized metal complexes, cobalt complex 25a (Fig. 6) displayed the highest fungicidal activity with lowest EC50 values of 353.55, 205.45 and 196.84 ppm for the F. solani, R. solani and S. rolfesii, respectively . Moreira et al. reported a series of bis-benzimidazole conjugates and screened for its antibacterial activity against selected microbes. Among the synthesized derivatives, compounds 26a, 26b and 26c possessed excellent activity against Gram-positive bacteria with MIC90 values between 0.06 and 1 mg/L. 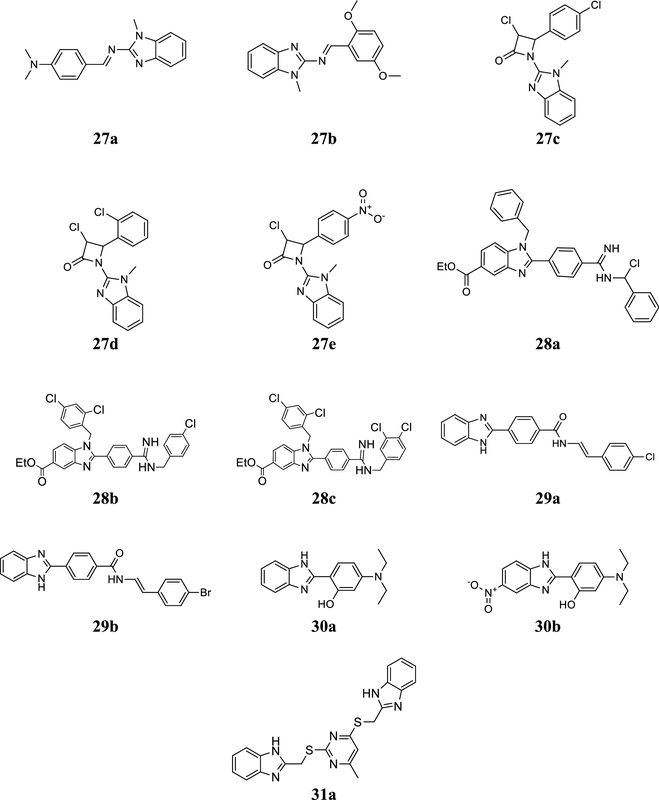 Compounds 26c and 26d exhibited significant activity against M. tuberculosis H37Rv with MIC value of 2 mg/L and 1 mg/L, respectively (Fig. 6) . Noolvi et al. developed a class of 1H-benzimidazole azetidine-2-one scaffolds and assessed for its antibacterial activity against selected bacteria (S. aureus, B. pumillus, E. coli and P. aeruginosa). The MIC and ZI of the synthesized compounds was determined by agar diffusion technique. Compounds 27a–27e showed significant antibacterial activity as comparable to ampicillin (Table 21, Fig. 7) . Ozden et al. synthesized a chain of benzimidazole-5-carboxylic acid alkyl esters and evaluated for its antimicrobial activity against methicillin resistant E. coli, MRSA, S. aureus, S. faecalis, MRSE and C. albicans. Compounds 28a, 28b and 28c exhibited promising antimicrobial activity as compared to reference drugs (Table 22, Fig. 7) . Ozkay et al. developed a series of benzimidazole compounds with hydrazone moiety and assessed for its in vitro antimicrobial potential against bacterial (E. faecalis, B. subtilis, L. cytogenes, S. aureus, P. aeruginosa, K. pneumoniae, E. coli ATCC 35218, E. coli ATCC 25922, S. typhimurium, P. vulgaris) and fungal (C. albicans, C. tropicalis, C. globrata) species by twofold serial dilutions technique taking chloramphenicol and ketocanozole as reference drugs. In this series, compounds, 29a and 29b showed promising antibacterial and antifungal activities as compared to standard drugs (Tables 23 and 24, Fig. 7) . Padalkar et al. synthesized a new class of 2-(1H-benzimidazol-2-yl)-5-(diethylamino) phenol derivatives and screened for its antimicrobial potential against S. aureus, E. coli, A. niger and C. albicans using serial dilution method. 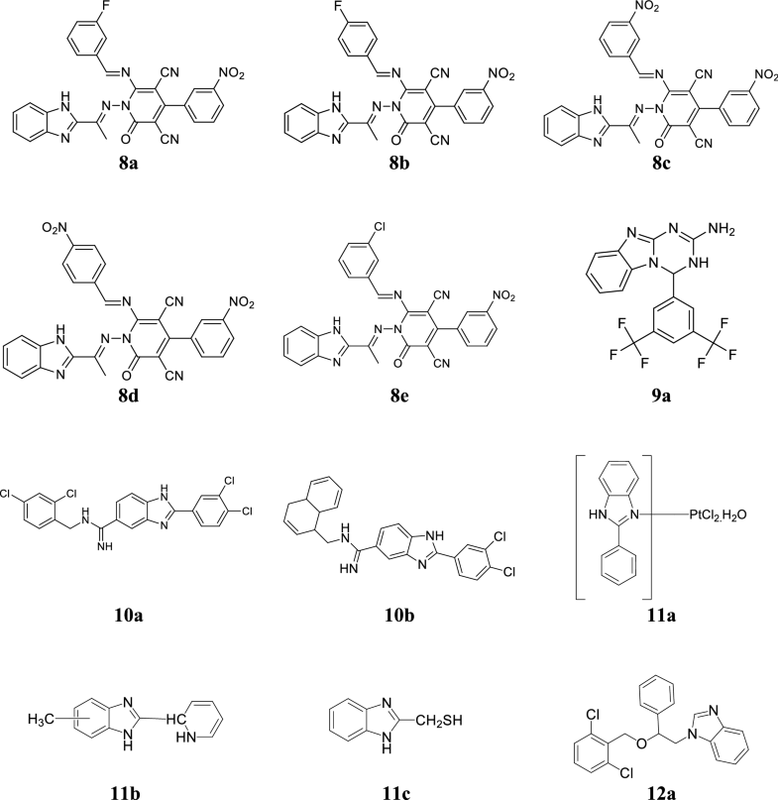 Among them, compounds, 30a (2-(1H-benzo[d]imidazol-2-yl)-5-(diethylamino)phenol) and 30b (5-(diethylamino)-2-(5-nitro-1H-benzo[d]imidazol-2-yl)phenol) displayed significant activity against tested bacterial species and their activity results are similar to the reference drug (Table 25, Fig. 7) . Seenaiah et al. 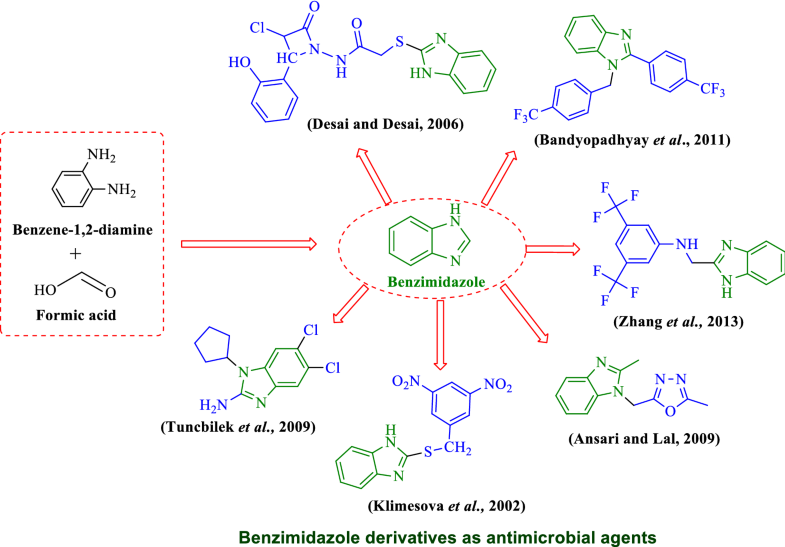 reported a series of benzimidazole derivatives and screened for its antimicrobial activity against selected bacterial and fungal species by agar well diffusion (ZI) and broth dilution methods (MIC). In this series, compound 31a displayed promising activity against tested microorganisms as comparable to standard drugs (Tables 26, 27, 28 and Fig. 7) . Tiwari et al. designed a new series of benzimidazole scaffolds and evaluated for its in vitro antifungal potential against A. flavus and A. niger by agar plate method. From the synthesized derivatives, compounds 32a and 32b showed excellent antimicrobial activity as comparable to reference (amphotericin B) (Table 29, Fig. 8) . Tuncbilek et al. designed some novel benzimidazole derivatives and screened for their antimicrobial potential toward E. coli, B. subtilis, MRSA (clinical and standard isolates), S. aureus and C. albicans. Compounds 33a–33d displayed the excellent antibacterial activity as comparable to reference drugs (sultamicillin, ciprofloxacin and ampicillin) (Table 30, Fig. 8) . Zhang et al. synthesized a chain of new actinonin derivatives of benzimidazole and evaluated for its antimicrobial potential against S. lutea, K. pneumoniae and S. aureus using microbroth dilution method. Compound 34a ((R)-3-(4-(1H-benzo[d]imidazol-2-yl)but-1-en-2-yl)-N-hydroxy heptanamide) showed potent antibacterial activity against tested microorganism than the standard drug (Table 31, Fig. 8) . Zhang et al. reported a class of substituted benzimidazole compounds and screened for its antimicrobial potential against two fungal, four Gram-positive and five Gram-negative bacterial strains through twofold serial dilution technique. Among them, compound 35a exhibited remarkable antimicrobial activity even better than the standards fluconazole, chloromycin and norfloxacin (Tables 32, 33 and Fig. 8) . Zhang et al. designed a novel class of benzimidazole type of fluconazole compounds and evaluated for its antimicrobial activity by two-fold serial dilution technique. Among them, compounds 36a and 36b exhibited the potent antimicrobial efficiency as compared to standards norfloxacin, chloromycin and fluconazole (Tables 34 and 35, Fig. 8) . Madabhushi et al. synthesized a new series of benzimidazole functionalized chiral thioureas and assessed for their antimicrobial activity against S. aureus, B. subtilis, S. aureus MLS16, M. luteus, K. planticola, E. coli and P. aeruginosa. Among them, compounds 37a and 37b displayed excellent antibacterial activity toward selected microorganisms (Table 36, Fig. 8) . Yadav et al. synthesized some 2-(1-benzoyl-1H-benzo[d]imidazol-2-ylthio)-N-substituted acetamide derivatives and evaluated for their antimicrobial activity (MIC and MBC/MFC) against tested strains by tube dilution method using cefadroxil and fluconazole as references. Among the synthesized compounds, 38a, 38b and 38c emerged out as excellent antimicrobial agents (Tables 37, 38 and Fig. 9) . Yadav et al. reported a class of novel benzimidazole derivatives and screened for its antimicrobial potency (MIC, MBC/MFC) against S. aureus, B. subtilis, E. coli, C. albicans, A. niger by tube dilution method using norfloxacin and fluconazole standard drugs. Compounds 39a and 39b showed prominent antimicrobial activity (Tables 39, 40 and Fig. 9) . Yadav et al. designed a series of new benzimidazole derivatives and accessed for its antimicrobial potential against S. aureus, B. subtilis, E. coli, C. albicans, A. niger by tube dilution method. In this series, compound 40a displayed the most potent antimicrobial activity (Table 41, Fig. 9) . Kerimov et al. developed new benzimidazole derivatives and evaluated for their antifungal activity against C. albicans and C. krusei by the agar diffusion method using fluconazole as standard. Among the synthesized compounds, compound 41a (Table 42 and Fig. 9) found to be most active against tested fungal species . Si et al. 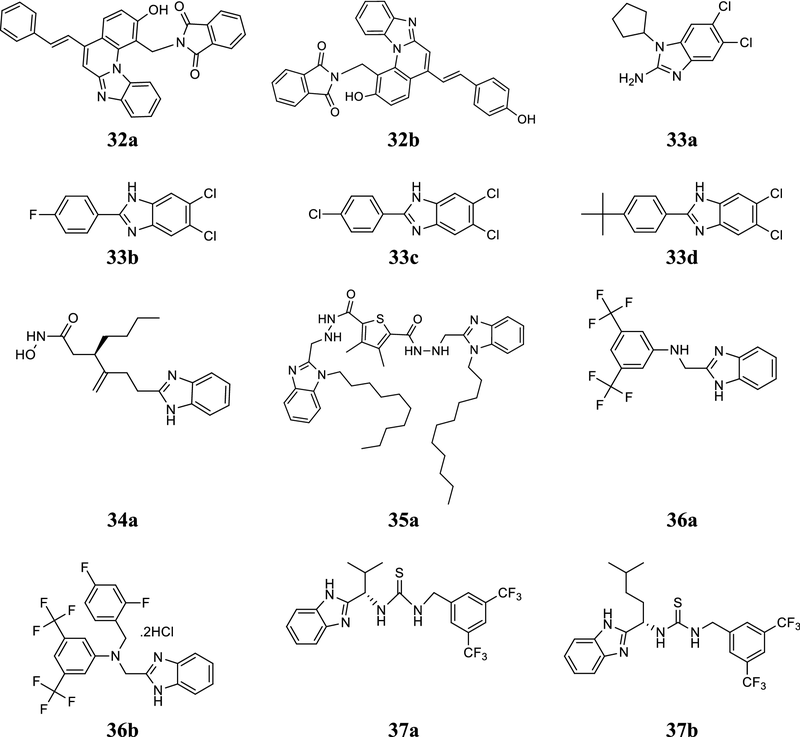 synthesized a series of new benzimidazole scaffolds and evaluated for their antifungal activity against Botrytis cinerea and Sclerotinia sclerotiorum using thiabendazole and azoxystrobin as references. 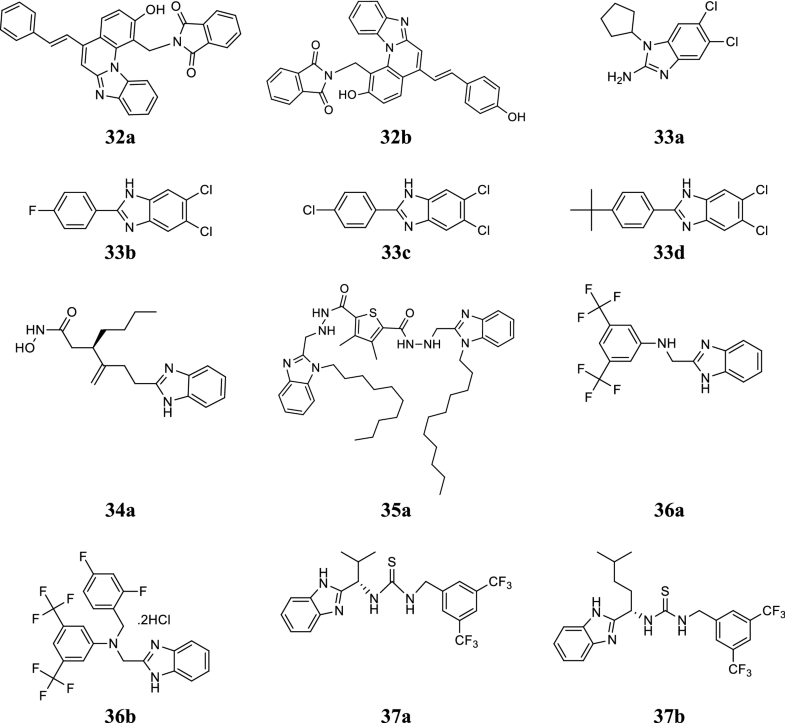 In this series, compound 42a exhibited excellent antifungal activity (Table 43 and Fig. 9) . Tahlan et al. reported a class of novel benzimidazole Schiff base derivatives and screened for its antimicrobial potency against tested microbial strains by tube dilution method. Among the synthesized compounds, 43a and 43b were found to be most potent antifungal agents against A. niger and C. albicans (Table 44 and Fig. 9) . Tahlan et al. reported a series of new benzimidazole Schiff base derivatives and evaluated for its antimicrobial potency against selected microbial species. In this series, compounds 44a and 44b showed significant antimicrobial activity towards tested bacterial and fungal strains (Table 45 and Fig. 9) . Yadav et al. 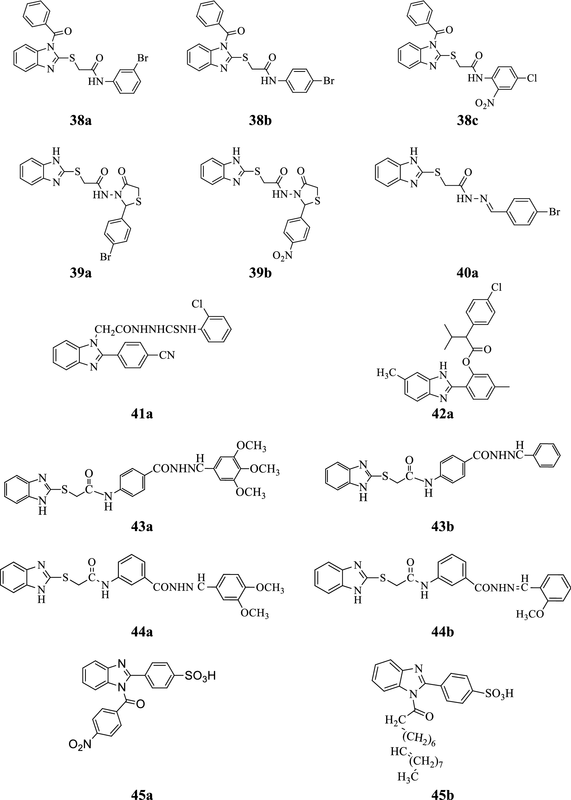 synthesized a series of novel benzimidazole derivatives and accessed for its antimicrobial activity against S. aureus, B. subtilis, E. coli, C. albicans and A. niger by serial dilution method using ciprofloxacin and fluconazole as standard drugs. From the synthesized derivatives, compounds 45a and 45b showed excellent antimicrobial activity against selected microorganisms (Tables 46, 47 and Fig. 9) . Summarizingly, after review of literature reports we concluded that benzimidazole is most promising category of bioactive heterocyclic compound that exhibit a wide variety of biological activities i.e. antimicrobial, anti-inflammatory, antiparasitic, antimalarial, antiviral, antimycobacterial, antineoplastic, antihypertensive activity etc. The present review only focus on antimicrobial activity of reported benzimidazole derivatives may serve as valuable source of information for researchers who wish to synthesize new molecules of benzimidazole nucleus which have immense potential to be investigated for newer therapeutic possibilities. Condensed information of most active compounds with their antimicrobial activity and abbreviation of microbial species and other are shown in Tables 48 and 49, respectively. BN, ST and SK have designed and prepared the manuscript. All authors read and approved the final manuscript.